With the recent unveiling of Movies Anywhere, Apple has—willingly or not, I do not know—opened up the world of iTunes to movies from other places. Stated another way, you can now have movies in the Tunes ecosystem that weren’t purchased there, or that weren’t digital versions acquired by using an iTunes redemption code with a physical disc purchase. To put it bluntly, this is huge; I’ve long wanted a way to get all of my movies into iTunes (and iOS) so that they could sync to devices, easily stream (without the computer on) to the TV, etc. The service goes well beyond iTunes/iOS, of course—the full list of supported players is quite extensive. Important: As of now, Movies Anywhere is a US-only service. If you’re not in the US, hopefully something similar will be coming to your country at some point in the future. Put an UltraViolet-only (i.e. no iTunes version) digital redemption movie into the iTunes ecosystem. Paid a modest fee—not to Apple—and converted an old physical DVD into a high-def —digital version. Note: The original version of this post stated that you could convert a DVD into a 4K iTunes video. That is not the case, based on this article and my own testing. Thanks to @netnothing for the pointer. How does this magic work? Honestly, I don’t really know. 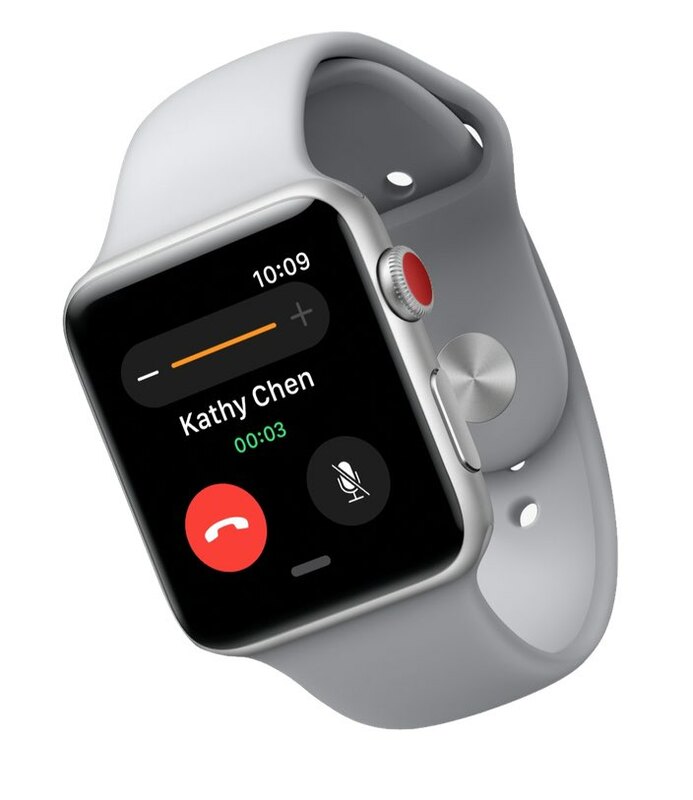 In their September 2017 keynote, Apple launched the Apple Watch Series 3, the Apple TV 4K HDR, and three new iPhones—the 8 and the 8 Plus, and the X. This is a nice evolution of the watch. The LTE doesn’t really interest me, as I’m sure it’ll require another $5 or $10 a month to my wireless carrier, and I almost always want my phone with me. (If I swam regularly, I might feel differently about that.) The much-faster CPU would be a nice upgrade over my original-generation watch, but the Series 3 is nearly a full millimeter thicker than the original…and honestly, I think the first version was already borderline too thick. Will I buy? At this time, the outlook is doubtful; my watch is working fine, and a faster CPU isn’t worth the added thickness and $359 of my money. Support for 4K is welcome, and long overdue. I’m not so sure about HDR; sometimes I find HDR images tend to look artificial, and I don’t know if I’d find the same issue in moving images. A real added bonus was Apple’s decision to provide the 4K version of movies you’ve purchased for free—this from a company that charged us to upgrade the quality of our music files a few years back. I wish Apple wasn’t so damn set on streaming everything, though—I would much prefer to store movies directly on the device, to make it more portable and not subject to the vagaries of wifi, device positioning, and network load. Those times are gone, though, so now the only choice is whether or not to spend $20 more for the 64GB version. Will I buy? Yes, and I’ll spend the extra $20 for the extra 32GB. I’ve been moving an Xbox One back and forth from the game TV to our 4K TV to watch 4K content, so this will be a simpler solution. I would have much preferred if Apple just blacked out that entire region, giving up that marginally-usable pixel space for a cleaner appearance. I understand that videos can play cropped, so as to not be “notched,” but it’s the presence of the notch in other normal views that really gets to me. It’s everywhere. Face ID. Apple has told us facial recognition is more secure, and I have no reason to doubt them. They also told us it’s fast, and it seemed to be in the demo. But secure and fast can’t override the absolute convenience of Touch ID. I can use Touch ID as I remove my phone from my pocket (press plus press-click), and it’s ready to go as soon as it’s out of my pocket. I don’t have to look at my phone unless I want to; if I have to look at my phone every time I want to unlock it, that’s going to get annoying. Very quickly. Apple Pay is even worse. Today’s system is as near-magic as any tech I’ve ever used: Hold the phone near the register, rest finger on the home button, and you’re done. With Face ID, it appears (based on the demo in the keynote), I’ll have to both double-tap the side button and look at the phone to use Apple Pay. Ugh. There are also some security considerations with Face ID, as pointed out by Ian Schray. The police cannot compel you to put your finger on your phone without a warrant…but can they compel you to simply look at your phone? Other than these two no-go items, I really like everything else about the iPhone X. It’s only marginally larger (.20 inches taller, .15 inches wider) than an iPhone 7, yet has a screen that’s 30% larger and has more pixels than the gigantic Plus model phones. It also has the double cameras, which I would love to have on my next phone. While you may not consider the notch and Face ID as deal breakers, they really are for me. I’ll go look at one in person, of course, but I simply cannot unsee the notch, and I hate the idea of having to look at my phone to unlock it, and taking more steps (and time) for Apple Pay. Will I buy? As of now, yes, I plan on buying an iPhone 8, and hoping that…somehow…Touch ID survives for a long time to come, lest that iPhone 8 be my last new iPhone. Update: Thanks to John for pointing out the obvious: The old remote works with the new Apple TV. So I guess I can go ahead and replace the one in the bedroom. Then I remembered the remote. For a device that I often use either while running on the treadmill (yea, it’s in our bedroom) or in the dark while going to sleep, the new Apple TV remote is unusable: The touch pad is a nightmare to try to use while running, and it’s tricky to use in the dark. It’s also nearly impossible to tell which side’s up in the dark. So no, new Apple TV, you’re not going to replace the old one in our bedroom. I’m not sure what I’ll do with the new one; we have another TV it could go on, but there’s no open HDMI port (it’s an old TV with just two HDMI ports, and it’s got an Xbox and a Blu-ray player). Time for an HDMI switch box? 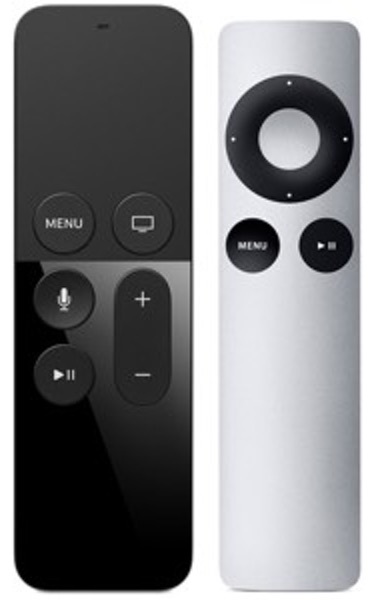 I’d love a non-touchpad remote for the new Apple TV, but I don’t see Apple going that direction at all. When I discovered that I could use the grid-style password entry on the new Apple TV, I thought I’d hold a little password entry shootout of sorts. I wanted to compare the three ways I’ve discovered of entering passwords on the fourth-generation Apple TV. Just for fun, I threw my iMac into the mix, too. Obviously, typing your password on a physical keyboard is incredibly fast and (assuming you’re a decent typist) basically error free. On the Apple TV, what I found is that regardless of method used (i.e. grid or line), the silver remote is both faster and more accurate than the Siri (black) remote. After discarding the Siri remote, I was notably faster using the silver remote with the grid layout than with the line layout. The other thing to notice is that I only had accuracy issues with the Siri remote. The first time I tried to enter my password for this test, it took me three tries to get my password correct. The 2:59 time shown for the “grid” line is the total of all three times (0:47, 0:57, and 1:15). I then tried again, going very slowly to make sure I didn’t make a mistake, which is the 1:41 time shown on the last row. I had no accuracy issues with the silver remote, regardless of line or grid data entry style. My fastest entry (0:47) with the Siri remote wasn’t that far behind the silver remote, but the accuracy was obviously not good. I had to work at half the pace of the silver remote to insure I didn’t make any errors with the Siri remote. Clearly password entry on the Apple TV is a hassle: Even with the silver remote, taking 41 seconds to enter a 22 character password is quite a waste of time. Apple really needs to address this, either by letting us pair a keyboard, or by updating the iOS Remote app to support the new Apple TV. For now, though, I’m sticking to the silver remote for password entry—even on the new line layout—because it’s both faster and more accurate than the Siri remote. 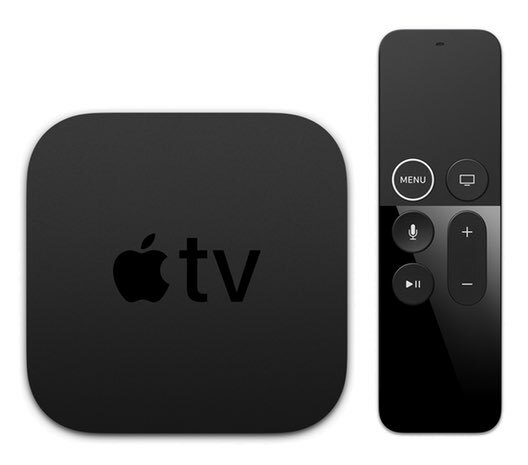 To use the old-style password entry screen on the new Apple TV, wake the Apple TV using the old silver remote, and don’t touch the new Siri remote. And that’s it. 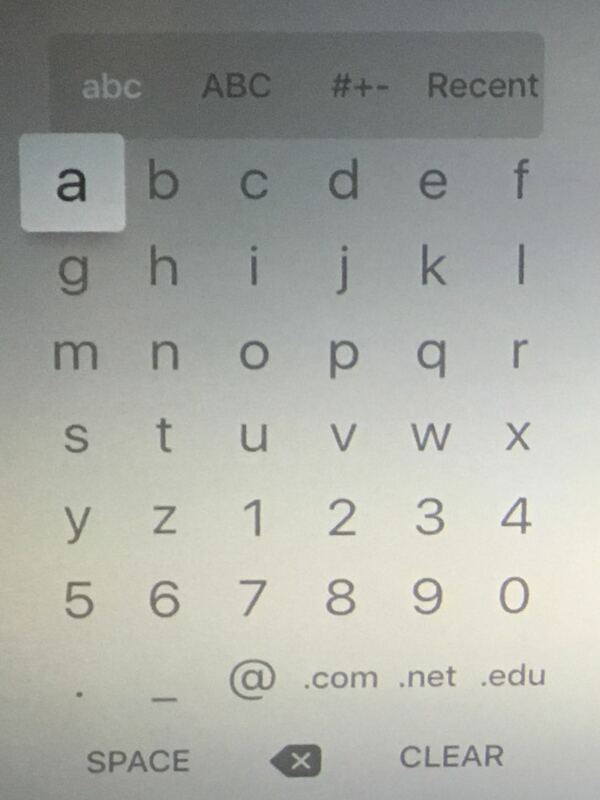 If you wake the Apple TV with the silver remote, and don’t touch the Siri remote until after you get to a password entry screen, you’ll get the grid. If the Apple TV pairs with the Siri remote, though, you’ll get the new-style line entry screen. I haven’t extensively tested this, but I did try on two different fourth-gen Apple TVs, and got the same results on both. So if you want to use the old password entry grid on your new Apple TV, get yourself a silver remote (if you don’t have one already). 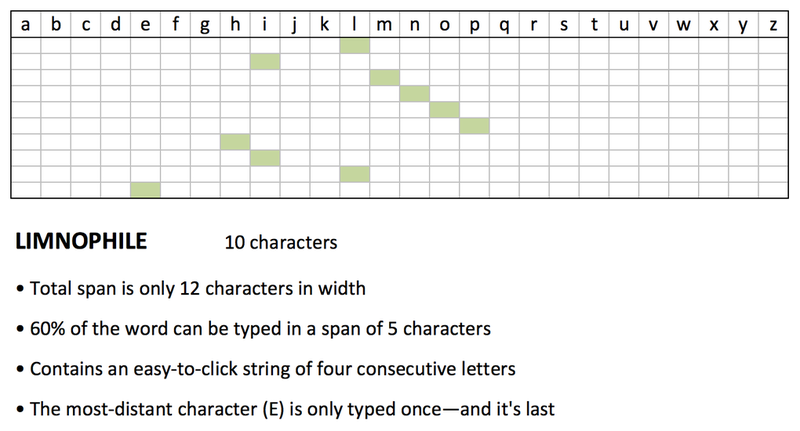 Presenting LIMNOPHILE, a 10-character yet easy-to-type Apple TV password. 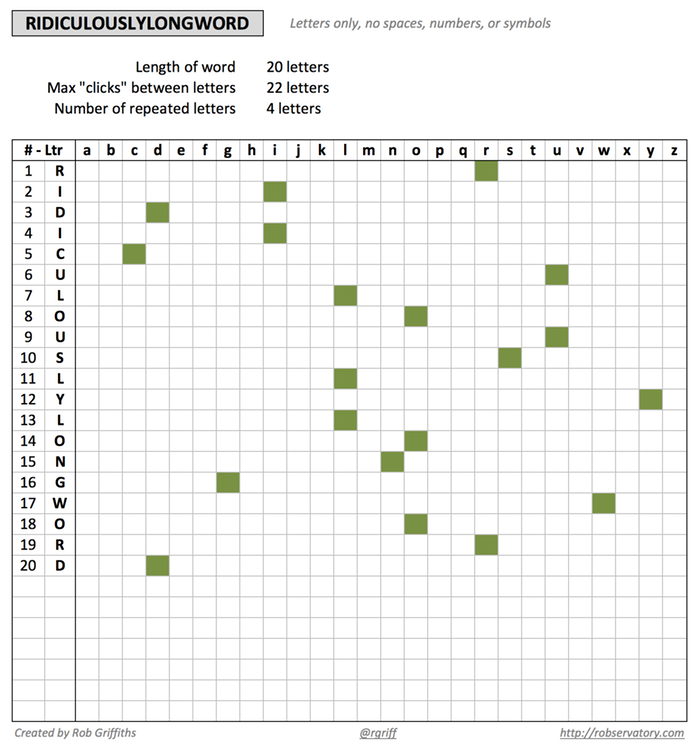 @rgriff Having it in Excel makes me happier, don’t want even a TV password getting seen by something external. Are you willing to share it? Just replace RIDICULOUSLYLONGWORD with whatever you like, and see how it’ll “click out” on your Apple TV. Obviously, this tool is totally tongue-in-cheek!. Any password built with this tool will be weak as heck. It’s just for fun, so don’t take it seriously. Feel free to share and modify, but I’d appreciate a credit back if you do so. Please note that this is an Excel file, and it relies on conditional formatting, so it may not work in Numbers.